Fight with the Living Dead. Movie zombies unnerve me. Whether the lumbering ghouls of George Romero’s Night of the Living Dead and Michael Jackson’s Thriller, or the track-stars-in-our-former-lives of 28 Days Later, carnivorous cadavers, foaming blood, coming from every direction are the stuff of which very bad dreams are made. 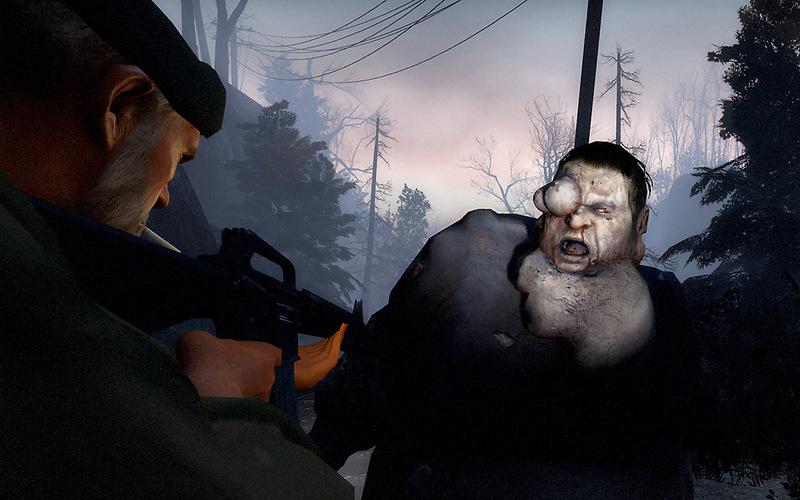 The November 18 release of Valve Corporation’s Left 4 Dead, above, then, pledges sleepless nights of sweat-drenched dread. The game pits four human survivors against armies of the rotting undead, says Valve, battling them in single player, co-op, and multiplayer game modes. Set in the immediate aftermath of the zombie apocalypse, L4D offers four expansive “movie campaigns” that challenge you and your fellow survivors to battle thousands of swarming zombies as you travel across the rooftops of an abandoned metropolis, through rural ghost towns and pitch-black forests. Mere words. Take a look at this clip from the game and hold on to your head. In the sequence, you and your three human co-partners—driven either by actual players or the machine’s AI—attempt to storm a kitchen in an overrun, infected house. This draws the zombies in for a meal—you—right as you draw your shotgun. Lemme at ‘em. On PC / Xbox 360. Should’ve show’d some scary hunters or tanks and maybe possibly witches. This game rocks! I participate in the ESL. to this zombie apoc whilst focusing on surviving. Don’t get it for the Xbox tho.